While playing at their grandparents’ house one day, Joshua and Krista discover a World War II uniform, helmet, and medals. Their grandfather shares with them the story of his proud days as a member of America’s first all-black flying squadron. When the Tuskegee Experience began in 1931, officials believed black people were incapable of learning to fly an airplane. The Tuskegee airmen proved them wrong, and served as a sterling example of what a people—thought best suited to janitorial work, cooking, and manual labor—could do. Partners in the firm of Homan and Reilly Designs, Lynn M. Homan and Thomas Reilly bring extensive experience in historical research, writing, and creative design to their work. They design, curate, and research museum exhibitions, including the acclaimed traveling exhibition, The Tuskegee Airmen, and a permanent exhibit at the Mighty Eighth Air Force Heritage Museum in Savannah, Georgia, called African-Americans in Aviation. Both Ms. Homan and Mr. Reilly lecture frequently across the United States. 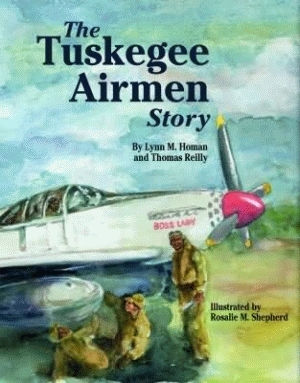 They are also coauthors of a book for adults, Black Knights: The Story of the Tuskegee Airmen, and Tuskegee Airmen, American Heroes, a chapter book for young readers. Illustrator Rosalie M. Shepherd is a landscape and portrait painter, works with oil, charcoal, and watercolor, and has worked extensively as a graphic designer.